Atypical pathogens such as Mycoplasma pneumoniae, Chlamydophila pneumoniae, and Legionella pneumophila are increasingly recognized as important causes of community acquired pneumonia (CAP) worldwide. Such etiological data for Vietnam is scarce and clinical doctors lack accurate information on which to base their diagnosis and treatment of pneumonia. This study identifies the prevalence and risk factors of severe community acquired pneumonia due to these atypical pathogens (severe-ApCAP) in children aged 1–15 years with CAP in a pediatric hospital in Hanoi, Vietnam. 722 hospitalized children with CAP were recruited for detecting those atypical pathogens, using multiplex PCR and ELISA. Clinical and epidemiological data were collected. Multivariate logistic-regression analyses were performed to evaluate the associations of potential risk factors with severe-ApCAP. Among 215 atypical pathogen-positive CAP cases, 45.12% (97/215) were severe-ApCAP. Among the severe-ApCAP group, 55.67% (54/97) cases were caused by pure atypical pathogens and 44.33% (43/97) resulted from a co-infection with typical respiratory pathogens. M. pneumoniae was the most common, with 86.6% cases (84/97) in the severe-ApCAP group, whereas C. pneumoniae and L. pneumophila were less frequent (6.19% and 7.22%, respectively). The highest rate of severe-ApCAP was in children younger than two years (65.98%). The differences related to age are statistically significant (P = 0.008). The factors significantly associated with severe-ApCAP were age (OR = 0.84, 95% CI = 0.75-0.93, P = 0.001), co-infection with typical bacteria (OR = 4.86, 95% CI = 2.17-10.9, P < 0.0001), co-infection with respiratory viruses (OR = 4.36, 95% CI = 1.46-13.0, P = 0.008), respiratory/cardiac system malformation (OR = 14.8, 95% CI = 1.12 -196, P = 0.041) and neonatal pneumonia (OR = 11.1, 95% CI = 1.06 -116, P = 0.044). Severe-ApCAP presented at a significant rate in Vietnamese children. More than 50% of severe-ApCAP cases were associated with pure atypical pathogen infection. M. pneumoniae appeared most frequently. The highest rate of severe-ApCAP was in children younger than two years. Younger age and co-infection with typical bacteria or viruses were the most significant risk factors, while respiratory/cardiac system malformation and neonatal pneumonia were additional potential risk factors, associated with severe-ApCAP in Vietnamese children. Worldwide, pneumonia is a leading cause of child death, killing 6.6 million children under the age of five years in 2012 . In Vietnam, community-based studies suggest that every child younger than five years suffers 5 to 8 episodes of acute respiratory infections annually , while hospital-based investigations indicate that 35-50% of all pediatric patients are hospitalized due to pneumonia. The Vietnamese Ministry of Health has reported that each year 4000 children younger than 5 years die from pneumonia in Vietnam . Atypical pathogens including M. pneumoniae, C. pneumoniae, and L. pneumophila cause mild, moderate or severe acute respiratory tract infections in children. These pathogens are increasingly recognized as important causes of pneumonia in many countries, but their role in Vietnam has not been well documented. This could diminish the effectiveness of the general guidelines for treatment of acute respiratory tract infections in Vietnamese children. Prior to 2012, only antibiotics of beta-lactam group which do not naturally affect those atypical pathogens were included in the guidelines for pneumonia treatment in children, notably omitting the macrolide group (erythromycin, clarithromycin, azithromycin), which is the first-choice therapeutic agent against atypical pathogen infections in both children and adults. Such incorrect treatment could result in serious pneumonia requiring hospitalization. Investigations of typical pathogens causing severe pneumonia in children have not included atypical pathogens because it is difficult and not relevant for clinical treatment to detect them by culture methods. This unique study used multiplex polymerase chain reaction (PCR) as the principal method and enzyme-linked immunosorbent assay (ELISA)-based specific IgM antibody for determination of these three atypical pathogens aimed at investigating prevalence of and risk factors for severe community-acquired pneumonia (CAP) caused by M. pneumoniae, C. pneumoniae and L. pneumophila in hospitalized children with CAP aged 1–15 years old in Vietnam. Seven hundred twenty-two hospitalized children aged 1 to 15 years with community-acquired pneumonia were recruited for the prospective hospital-based study at the National Hospital of Pediatrics (NHP), Hanoi. This study was conducted from July 2010 through March 2012, with the approval of Research Ethics Committee, NHP, Hanoi, Vietnam and the agreement from the parents of these patients to participate in the study. (ApCAP) case we used was the following: 1) patients with clinical symptoms of pneumonia, confirmed by radiography and 2) presence of M. pneumoniae and/or C. pneumoniae and/or L. pneumophila, detected in broncho-alveolar lavages, identified by multiplex PCR and ELISA-based specific IgM antibodies against M. pneumoniae, or C. pneumoniae, or L. pneumophila in one of paired sera. + Major criteria (≥1 major criteria): invasive mechanical ventilation; fluid refractory shock; hypoxemia requiring fraction of inspired oxygen (FiO2) greater than inspired concentration or flow feasible in general care area. + Minor criteria (≥2 minor criteria): respiratory rate higher than WHO classification for age; apnoea; increased labored breathing; the ratio between partial pressure of arterial oxygen (PaO2) and fraction of inspired oxygen (FiO2) < 250; multilobar infiltrates (≥2 lobes); Pediatric Early Warning Signs (PEWS) score > 6; altered mental status; hypotension; presence of effusion. The sample size of 710 was calculated (Additional file 1) to estimate the prevalence of ApCAP of 23.5% within 0.032 with 95% confidence interval, considering the following parameters: α = 0.05, β = 0.2, and nonresponsive rate = 5% . At the time of admission, systematic recordings were made for each patient, including medical history, the underlying respiratory symptoms and physical examination. Epidemiological information was collected by interviewing each patient’s parent using a standardized questionnaire. After a complete physical examination, chest X-rays were taken. Two senior radiologists read the X-rays and agreed on the conclusion. Enrolled patients were investigated for microbiological diagnosis based on respiratory specimens (broncho-alveolar lavages) and two serum samples collected at admission and again after three weeks. The laboratory tests were performed on blood specimens taken to count leukocytes (WBC), C-reactive protein (CRP) and for the detection of IgM antibodies against M. pneumoniae, C. pneumoniae and/or L. pneumophila. Broncho-alveolar lavages were used for detection of M. pneumoniae, C. pneumoniae and L. pneumophila specific DNA by multiplex PCR. In addition, real-time polymerase chain reaction (RT-PCR) was applied to determine the presence of viral respiratory pathogen co-infection (adenovirus, respiratory syncytial virus (RSV), rhinovirus, influenza A & B, parainfluenza 1–3 viruses) using the method of Robin Brittain-Long et al. . For viral RNA extraction we used QIAamp Viral RNA Mini kit (QIAGEN Strasse 1, 40724 Hilden, Germany, Cat No. 52906). The RT-PCR was done using Kit SuperScript III One-Step Kit (Invitrogen Co., 3175 Staley Road, Grand Island, NY 14072, USA). We used the quantitative culture method to detect typical bacterial respiratory pathogens such as Haemophilus influenzae, Streptococcus pneumoniae, and Moraxella catarrhalis in bronchoalveolar lavages and the results were analyzed according to the published method . Broncho-alveolar lavages were kept at −70°C. At test time, all sample volumes were thawed, mixed well, and centrifuged at 15,000 rpm for 10 min at room temperature. Most of the supernatant was discarded and 200 μl of the pellets was used for DNA extraction with QIAamp DNA Mini Kit (QIAGEN Strasse 1, 40724 Hilden, Germany, cat #51304) according to the manufacturer’s instructions. M. pneumoniae, C. pneumoniae and L. pneumophila DNA were detected by the Multiplex PCR method with primer sets for amplification of the P1 gene for M. pneumoniae (MP-F: 5’- AACTATGTTGGTGTATGACCAGTAC-3’ and MP-R: 5’- ACCTTGACTGGAGGCCGTTA-3’) ; the major outer membrane protein gene for C. pneumonia (CP-F:5’-GTTGTTCATGAAGGCCTACT-3’ and CP-R: 5’-CGTGTCGTCCAGCCATTTTA-3’)  and macrophage infectivity potentiator gene for L. pneumophila (mip F2: 5’- GCATTGGTGCCGATTTGG-3’ and mip R2: 5’- GCTTTGCCA TCAAATCTTTCTGAA-3’) . The details of the multiplex PCR applied to detect atypical pneumonia pathogens are presented in Additional file 2. Two serum samples were collected from each patient, the first on admission and the second after 3 weeks, and stored at – 20°C until testing. Titers of specific IgM were evaluated using commercial test kits for M. pneumoniae ELISA-IgM (Mycoplasma pneumoniae ELISA IgM Ref # M1002), C. pneumoniae ELISA-IgM (Chlamydophila pneumoniae ELISA IgM Ref # M1007) and L. pneumophila ELISA-IgM (Legionella pneumophila ELISA IgM Ref # M1000) Kits (Vircell S.L, 18016 Granada, Spain), respectively, following the manufacturer’s instructions. The result was recorded as positive when the IgM antibody (Ab) index was greater than 11, as equivocal between 9 and 11, and as negative if under 9. Frequencies of categorical variables were compared by Fisher’s exact test when appropriate. Binary logistic regression analysis was used to assess factors potentially associated with severe ApCAP due to M. pneumoniae, C. pneumoniae and L. pneumophila. Multivariate logistic-regression analyses with backward stepwise method were performed to test several models for the associations of severe ApCAP with the potential risk factors. Here, the data are presented as odds ratios with 95% confidence intervals (95% CI). The level of significance was set to 0.05 for all analyses. The above statistical procedures were performed using SPSS version 16.0 (SPSS, Chicago, USA). The socio-demographic characteristics of 215 children suffered from severe or non-severe ApCAP are shown in Additional file 3. Except for age, there were no significant differences between severe-ApCAP and non-severe ApCAP patients with regard to gender, area of residence, kindergarten attendance, living conditions (air-conditioning, dust and/or smoke pollution), or mother’s education level and occupation. As tabulated in Table 1: on the basis of PCR and serological tests, out of 722 hospitalized children with pneumonia, 215 (29.78%) cases were positive for atypical pathogens. The total with M. pneumoniae pneumonia was 190/215 cases (88.37%). Among these, M. pneumoniae was detected by PCR in 181/190 (95.26%), by ELISA-IgM in 148/190 cases (77.89%) and by both PCR and ELISA in 139/190 (73.16%). C. pneumoniae was detected 13/13 cases by PCR, 6/13 (46.15%) by ELISA. L. pneumophila was detected in 12/12 cases by PCR and in 11/12 cases by ELISA. Pursuant to the criteria of PIDS and the IDS of America for Classification of Severe pneumonia in Children, of the 215 ApCAP cases, 97 (45.12%) were assigned to the severe-ApCAP group, while 118 (54.88%) were classified as non-severe ApCAP. In both pneumonia forms, M. pneumoniae was associated with the highest proportions, for example, 86.60% of severe- ApCAP cases (84/97) and 89.83% (106/118) of non-severe ApCAP. Two remaining atypical pathogens appeared less frequently. C. pneumoniae was detected in 6.19% (6/97) of severe-ApCAP and 5.93% (7/118) in non-severe ApCAP while L. pneumophila was found in 7.22% (7/97) of severe and 4.24% (5/118) of non-severe cases (Table 2). Data are number (%). P-value by Fisher’s exact test. In Table 3, it can be seen that among 97 severe-ApCAP cases, ‘pure atypical pathogen’ was associated with 55.67% (54/97) of cases, but only one atypical pathogen was responsible for most of those (51.55%, 50/97). A mixed atypical pathogen infection was present in 4.12% (4/97). The rates of co-infection with other pathogens (typical bacterial pathogens, respiratory viruses, and with three types of pathogen - atypical pathogen, typical bacterial pathogen and respiratory virus in the same sample) in severe-ApCAP group were 27.83% (27/97), 13.4% (13/97) and 3.1% (3/97), respectively. In the non-severe ApCAP group, the rates were 9.3% (11/118); 5.1% (6/118) and 0.8% (1/118) (P < 0.0001 and P < 0.008), respectively. Streptococcus pneumoniae was the most commonly found pathogen in co-infection cases in the severe-ApCAP group (14/27). Co-infection with typical bacteria or a respiratory virus increased the risk of suffering severe pneumonia (OR = 4.62; 95% CI = 2.11-10.1; P < 0.0001 and OR = 4.07; 95% CI = 1.46-11.4; P = 0.007, respectively) (Table 3). P-value obtained from logistic regression analysis. Table 4 shows that of the 97 severe-ApCAP cases, 66% (64/97) occurred in children younger than 2 years, 21.65% (21/97) in children from 2 to less than 5 years old, 11.34% (11/97) in children from 5 to less than 10 years, and 1% (1/97) in children 10 or older. The differences related to age were statistically significant (P = 0.008). P = 0.008, Fisher exact test. 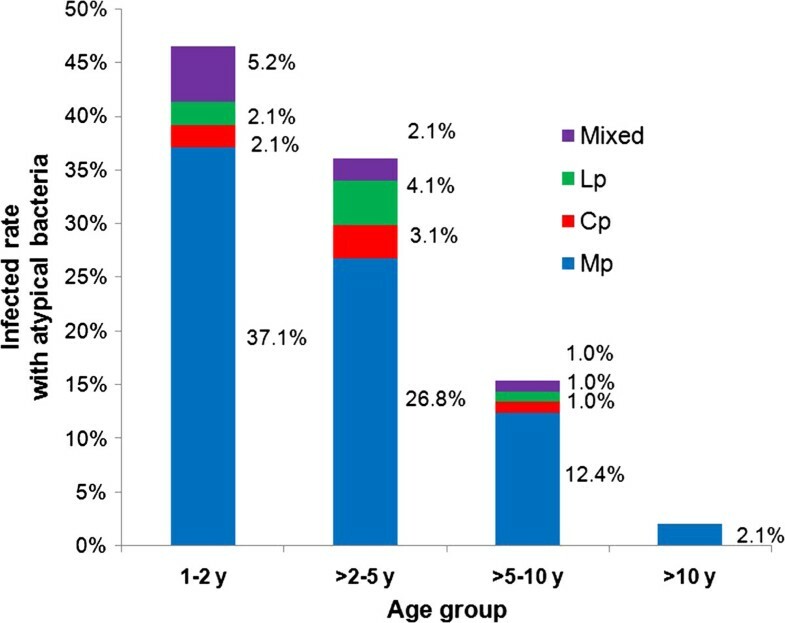 Figure 1 illustrates the role of each atypical pathogen causing severe-ApCAP in children and their distribution by age. M. pneumoniae was the most frequently occurring agent, with the highest proportion of infections in children younger than 2 years and decreasing gradually in frequency in older children. Distribution of severe-ApCAP cases by ages and by pathogens. Blue, red, green, and purple indicate the percentage of M. pneumoniae (Blue square Mp), C. pneumoniae (Red square Cp), L. pneumophila (Green square Lp), and atypical pathogen mix-infection (Violet square Mixed), respectively, detected in each age group. In Table 5, significantly associated risk factors were: age – the younger the child, the greater the chance of severe ApCAP (OR = 0.84; 95% CI = 0.75-0.93; P = 0.001), co-infection with typical bacterial pathogens (OR = 4.86, 95% CI = 2.17-10.9, P < 0.0001), co-infection with respiratory viruses (OR = 4.36, 95% CI = 1.46-13.0, P = 0.008), respiratory/cardiac system malformation (OR = 14.8; 95% CI = 1.12 -196; P = 0.041) and neonatal pneumonia (OR = 11.1; 95% CI = 1.06 -116; P = 0.044). None of the other variables investigated, including gender, nutrition status, weight at birth, history of respiratory/cardiac system disease, asthma, duration of illness prior to hospitalization, antibiotic usage, and others were significantly associated with severe-ApCAP (data not shown). Odds ratio (OR) and P-values were adjusted by all variables in the table. Worldwide, these three atypical pneumonia agents are each responsible for 10% to 30% of CAP in children . Among them, M. pneumonia is the most common causative agent, followed by C. pneumoniae and L. pneumophila. This is the first investigation of severe ApCAP in children in Vietnam based on molecular and serological diagnosis. Pursuant to the criteria of PIDS and the IDS of America for severe pneumonia, the 215 ApCAP cases in our study were classified as severe-ApCAP (45.12%) or non-severe ApCAP (54.88%). In both groups, M. pneumoniae accounted for the majority of infections (86.6% and 89.83%), while C. pneumoniae and L. pneumophila were much less common (<10% for each). According to the literature, atypical pathogens, especially M. pneumoniae and C. pneumonia, could be considered as co-infective agents in severe pneumonia [12–15], significantly enhancing the severity of the pneumonia. However, in our study, pure atypical pathogen infections played an important role in severe-ApCAP, causing more than half of severe-ApCAP cases. Co-infection with other pathogens (typical bacterial pathogens or viruses) was found in just under half of the cases. Among these, more than 50% of co-infection with typical bacteria was with Streptococcus pneumoniae. A number of published reports [16–20] suggest that M. pneumoniae and C. pneumoniae infections occur more frequently in children older than two years and in school-age children (older than five years). In our study population, the highest proportion of general ApCAP and of particularly severe-ApCAP cases occurred in children younger than two years. These differences by ages were statistically significant. In addition, M. pneumoniae appeared to be the most important atypical pathogen in all age groups with severe-ApCAP, compared to other atypical pathogens, especially in children younger than two years. Hence, it can be said that pure atypical pathogen infections, especially with M. pneumoniae appear to play an important role in pneumonia/severe pneumonia in young children in Vietnam. Before this study, based on published data outside of Vietnam [20–23], most Vietnamese pediatricians omitted atypical pathogens, especially M. pneumoniae (causing pneumonia) in children younger than 2 or 5 years in their diagnosis and treatment. This study provides evidence for the need to revise the existing diagnostic and treatment criteria in Vietnam. The results above strongly suggest that pure atypical pathogen infections play an important role in causing severe-ApCAP in Vietnamese children. Using appropriate statistical methods, we investigated potential risk factors for these infections. The results identified several significant risk factors associated with severe-ApCAP: age, co-infection status, respiratory/cardiac system malformation, and neonatal pneumonia. Age is generally considered as a factor associated with incidence of pneumonia and mortality rate in children younger than two years. A Thai study reported that the mean age of severe M. pneumoniae CAP was around 21 months, in severe C. pneumoniae CAP about 49 months, and again about 24 months in severe co-infection pneumonia . However, there are reports of severe-ApCAP occurring in healthy adolescents and adults [25, 26]. In our study, the highest proportion of severe-ApCAP infections occurred in children younger than two years; our analysis also indicated that age is significantly associated with severe-ApCAP: the younger the child, the more likely that the ApCAP will be severe. In cases of co-infection in our study, it is difficult to identify which pathogen was the first cause, especially because the National Hospital of Pediatrics in the capital city-Hanoi is often the last in a line of many health care providers. At the time the patient was admitted, laboratory tests such as WBC, CRP often indicate an acute bacterial infection. However, it is probable that when more microbiological pathogens afflict the patient, the resulting illness will be more severe [13, 15]. In our study, the proportion of severe pneumonia due to pure atypical pathogens was considerable, more than half. Co-infection with typical bacteria was also significantly associated with severe ApCAP. Co-infection between M. pneumoniae and S. pneumoniae appeared most frequently, more than half of the co-infections, followed by H. influenzae and then others (Moraxella catarrhalis, Klebsiella pneumoniae, Staphylococcus aureus). Co-infections with respiratory viruses (adenovirus, rhinovirus, influenza A, B viruses and RSV) could also enhance the severity of pneumonia. The contribution of co-infections to the severity of atypical pneumonia was assessed by multi-variable logistic-regression analysis. Co-infection with one of the typical bacterial pathogens could increase severe-ApCAP cases by 4.86 times and with respiratory viruses to 4.36 times compared with pneumonia caused by only one atypical pathogen. Atypical pathogen co-infection was not significantly associated with severity when compared with CAP due to only one atypical pathogen. Co-infection with typical bacterial pathogen and respiratory virus was also not significantly associated with severe ApCAP. This was somewhat unexpected and may be due to the small number of such samples. Health status is one factor that could influence recovery from pneumonia or severity of the illness in children. In our study, respiratory/cardiac system malformations and neonatal pneumonia were identified as potential risk factors in severe ApCAP. These factors have a physical correspondence with recurrent bronchitis or pneumonitis in childhood [27, 28]. However, the vibration amplitude of both variables was rather large, so the study should be expanded to confirm this result. In general, atypical bacteria, especially M. pneumoniae and C. pneumoniae are difficult to isolate. Serodiagnostic methods based on IgM detection or elevated IgG titer depend on the duration of the illness and on the immune response of each individual. The development of PCR has provided an alternative diagnostic method for etiological agents that are difficult to culture or detect. PCR-based assays can provide results quickly and avoid the risk of false negative results in conventional culture methods. In this study, we used a combination of conventional multiplex PCR and specific IgM antibody determination to detect three targeted atypical pathogens (or atypical bacteria) and to maximize the etiological diagnosis. However, a limitation was that we could not use real-time PCR for detection of the atypical bacteria, which is much more sensitive than conventional PCR. Due to financial limitations, we could not expand to use other diagnostic tools such as antigen detection test in urine for Legionella infection or real-time PCR for detection of typical bacterial infections in patients who had taken antibiotics prior to admission. In Vietnamese children, a significant proportion of severe community-acquired pneumonia was caused by the atypical pathogens (M. pneumoniae, C. pneumoniae and L. pneumophila). Mycoplasma pneumoniae was the most common pathogen in severe-ApCAP. Among severe-ApCAP cases, pure infections with atypical pathogens accounted for more than half of the cases. The highest rate of severe-ApCAP cases was seen in children younger than two years. Several risk factors were identified, among which age and co-infection with typical bacterial pathogens or respiratory viruses were the most significant. Respiratory/cardiac system malformation and neonatal pneumonia were also important risk factors for severe-ApCAP in Vietnamese children. Therefore, these pathogens, especially M. pneumoniae should be added to the diagnostic protocols for children with pneumonia, and to surveillance of respiratory infections, especially among younger children. Severe form of community-acquired pneumonia due to atypical pathogens. The authors wish to thank Dr. Tsuguo Sasaki – senior researcher on M.pneumoniae infections at the National Institute of Infectious Diseases, Tokyo, Japan for critical review. Sincere thanks are due to Prof. Nguyen Thanh Liem – Former Director of National Hospital for Pediatrics, Hanoi, Vietnam for supporting the study, and to Do Thi Bich Ngoc and to our colleagues at National Institute of Hygiene & Epidemiology and National Hospital of Pediatrics, Hanoi, Vietnam. The authors wish to thank Dr. Victor Fitzmaurice, Dr. Vu Tan Trao, and Dr. Elaine Pamela Wright for English edition and critically reading the manuscript. This study was supported by The National Foundation for Science and Technology Development (NAFOSTED), grant no. 106.03-2010.36 from The Ministry of Science and Technology, Vietnam. PLTH conceptualized and designed the study, designed and performed laboratory analyses, drafted the initial manuscript, reviewed and revised the manuscript, approved the final manuscript as submitted. PTH recruited patients, collected and entered data, follow –up patients and approved the final manuscript as submitted. NTPL participated in laboratory analyses, reviewed the manuscript and approved the final manuscript as submitted. TQB cleaned data, supervised data collection, performed statistical analyses, critically reviewed the manuscript, and approved the final manuscript as submitted. DMT recruited patients, follow –up patients and approved the final manuscript as submitted. DDA critically reviewed the manuscript and approved the final manuscript as submitted.